ANN ARBOR, Mich. – Ketamine was first introduced into clinical practice by investigators at the University of Michigan in the mid-1960s as a general anesthetic that could offer advantages, such a preserving breathing, not afforded by other anesthetic drugs at the time. “It’s an anesthetic, but more recently has been found to have antidepressant and analgesic properties at lower doses,” says George A. Mashour, M.D., Ph.D., professor of anesthesiology, director of the Center for Consciousness Science and associate dean for clinical and translational research at the University of Michigan Medical School. Mashour is the senior author of a new study published today, with an accompanying editorial, in The Lancet that sought to discover what effect ketamine has on delirium and pain — two serious postoperative complications. Which is why he and his close collaborator, Michael Avidan, MBBCh, professor of anesthesiology and cardiothoracic surgery at Washington University School of Medicine in St. Louis, sought to examine the drug’s supposed benefits more closely. Of the 1360 total patients assessed, 672 were eligible and randomized to three different arms — with 222 in the placebo group, 227 in the low-dose ketamine group and 223 in the high-dose ketamine group. Participants were assessed twice a day for the three days following surgery for delirium and pain. The researchers also recorded each patient’s postoperative opioid use, hallucinations and nightmares. “Unfortunately, we also found that some of the known negative effects of ketamine, such as hallucinations and nightmares, were increased in dose-dependent ways,” Mashour says. It has really a curtain raiser study conducted at the right time Dr Mashour. It is interesting to see such outcome regarding pain in this study however I am keen to see confirmatory study as well. In my practice ketamine in doses of 0.5 mg / kg bolus does produce analgesia at least plus some alteration of consciousness too . I believe filurther studies are important to confirm the outcome above . It was in an older patients peharps in children and adults it can be different because it surely works on NMDA receptors, and it is linked with pain and so on. 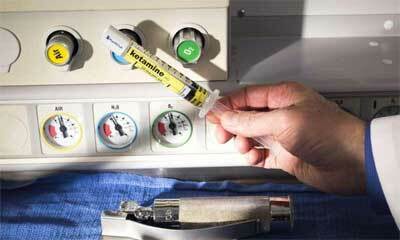 also there is a S-ketamine which is more powerful and has less side effects.